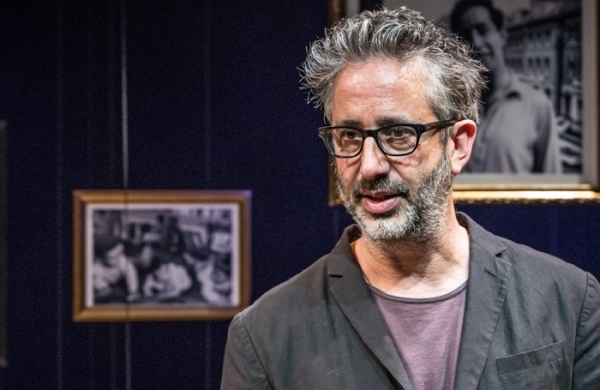 As a Twitter geek, one of the things I enjoyed most about David Baddiel‘s latest one-man show My Family: Not the Sitcom, which is now enjoying its second West End run at the Playhouse Theatre after premiering last year at the Menier Chocolate Factory, is how he so successfully employs social media in his storytelling. As Baddiel makes clear himself, My Family is not about social media. (It’s about, as the title indicates, his family and more specifically his late mother’s openly conducted, extra-marital affair and his still-living father’s slide into a foul-mouthed dementia, and his conflicting feelings of grief.) But he uses social media to introduce us to some of the people discussed and to, expertly, turn a mirror on ourselves and society at large. You don’t need to be a Twitter expert yourself to appreciate Baddiel’s analysis. As he flashes tweets up on the onstage screen, Baddiel explains in amusing lay terms the differences between technicalities such as RTs, likes and hashtags, as well as user types. A troll shares similarities with social justice warriors but their motivations are not the same – what they do have in common is that, in the social media world, outrage is a key badge of identity. Anger, says Baddiel, turns up the volume on who you are and, on social media, you can unleash it freely. I’d love to be a fly on the wall if any of Baddiel’s online attackers, whose tweets he mirthfully but mercilessly deconstructs, ever attended My Family. As someone who’s also highly active on Twitter and quite politically outspoken, I’ve had my own share of abuse – from both the right and the left as well as garden-variety misogynists of whatever political persuasion. I don’t fancy my chances of turning my tweets into a West End stage hit. But, in honour of Baddiel and his mum, here’s a rundown of my some of my most trolled tweets over the past two, politically tumultuous years. My Family: Not the Sitcom runs at the Playhouse Theatre and The Miser runs at the Garrick Theatre, both finishing their limited seasons on 3 June 2017. As a UK/US dual national, pro-European, “luvvie libtard” who views what is happening with populism globally as intrinsically linked, I’ve had a few tweets in the past two years that have caught heat on both sides of the Atlantic (and in more than one language). I could explain my frame of mind at the time behind each – the one on the day Jo Cox was murdered was definitely ill-phrased (Jo was an MP I admired long before she was eulogised and the tweet was sent before she was pronounced dead) – but I’ll let my 140-character-limited missives and the outsized reactions to them speak for themselves. Presented in chronological order, it’s interesting for me to look back and see how closely these outbursts track my political ups and, let’s be frank, mainly downs since May 2015. But where does despair get us? (Answer: nowhere.) As we head into another dash to the ballot box, during which I’m campaigning for the Liberal Democrats for the first time, I have no intention of either shutting up or giving up. While I can’t resist venting on politics, I do mainly tweet about theatre. Here’s what I’ve tweeted about My Family: Not the Sitcom and The Miser. Top Trumps podcast: What can we do next as progressives? 6 Quotes: What can Buried Child tell us about Trump's America? What would Jeremy Corbyn do for the arts? Since 1996, I have been passionate about promoting UK theatre, not least through WhatsOnStage.com and the WhatsOnStage Awards, which I founded, and my latest theatre websites, StageFaves.com, a pioneering social media directory for musicals, and MyTheatreMates.com, a portal for theatre bloggers I co-founded with Mark Shenton. In addition, I have hosted hundreds of post-show Q&As, panel debates and other talks with all types of theatremakers. I have also written for various publications including The Times, Evening Standard, Express and Daily Telegraph, and have commented on theatre in a wide variety of print, digital, and broadcast media. Apart from my love of theatre, I am the author of two published novels, Come Clean and Beware the Dwarfs. Follow me on Twitter @TerriPaddock. Tony’s Last Tape Q&A video and photos: What would Tony Benn have thought of Brexit, Corbyn & this play about him?